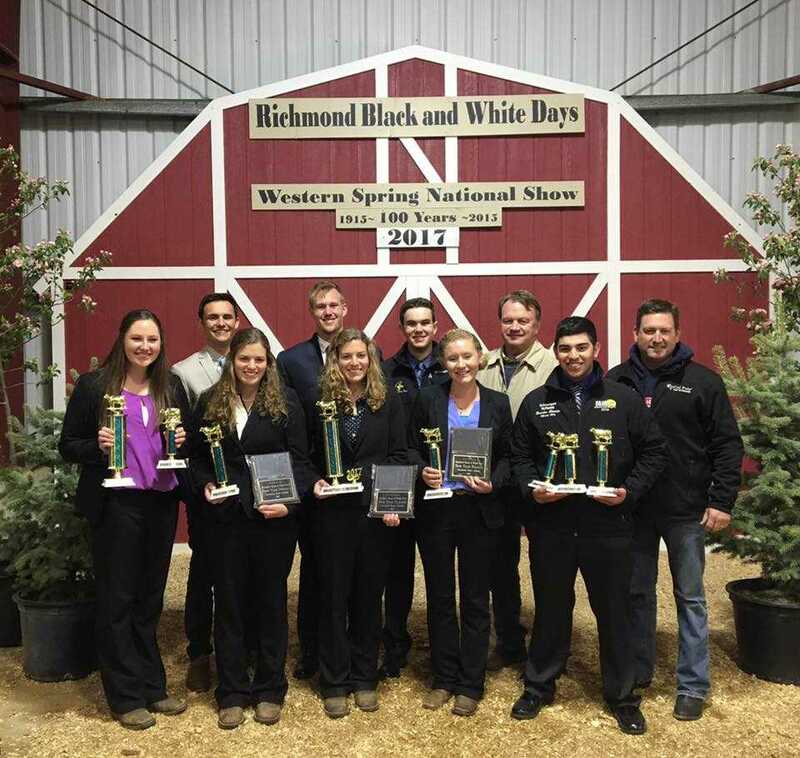 SAN LUIS OBISPO — Cal Poly dairy science students were among the top contenders at the recent Western Spring National Collegiate Dairy Judging Contest in Richmond, Utah. Cal Poly took two teams of students to the competition, coached by dairy science lecturer Rich Silacci and assisted by Professor Stan Henderson. Ten teams from across the country competed, including teams from Ohio State, Oklahoma State, Kansas State and Modesto Junior College. Participants, working on four-person teams, judged 10 classes of Holstein cattle. Each contestant then gave an oral presentation (called reasons) defending their placings for five of those classes. The Cal Poly Gold Team — comprised of dairy science seniors Alexandra Gambonini of Petaluma and Hannah Neer of San Luis Obispo, and dairy science juniors Elise Regusci and Elisabeth Regusci, both of Modesto — took first place overall and in placings and reasons. The Cal Poly Green Team — comprised of agribusiness freshman Nico Marsigli of Gustine, dairy science sophomore Jack Vander Dussen of Hanford, dairy science junior Hank DeVries of Buhl, Idaho, and dairy science freshman Brandon Almeida of Hilmar — placed third in reasons and sixth overall. Individual placings include Elisabeth Regusci placing first in reasons and overall; Gambonini placing second overall and third in reasons; Almeida placing second in reasons and fourth overall; and Elise Regusci placing sixth overall. The dairy science students are (back row, left to right): Hank DeVries, Jack Vander Dussen, Nico Marsigli, and Professor Stan Henderson; and (front row, left to right): Alexandra Gambonini, Elisabeth Regusci, Elise Regusci, Hannah Neer, Brandon Almeida, and lecturer Rich Silacci.